Ars longa, vita brevis or “Art is long, life is short”. Though Hippocrates was referring to the wonders of the “medical craft” rather than pure art, let us interpret the aphorism attributed to the ancient Greek physician in a renaissance man’s frame of mind. Let us look at it through the prism of the humanities at large, a human culture which lies at the most vibrant intersection of numerous academic disciplines, be they history, languages, philosophy, music or art. The humanities encompass countless wonders, ars longa is boundless, embodying myriad lives, toying with thoughts and currents, always bringing them to the same humanities communion. This is when all the disciplines nurture and complement one another, direct, question and answer each other, allowing us to taste their elixir and pass it to the next generation. In this fascinating inter-disciplinary network – centuries filled with creative minds – it goes without saying that we also find novelists, poets and composers. And this is where greats such as Shakespeare, Moliere, Goethe, Dante, Byron and Hugo stand side by side with the eminent composers: Mozart, Tchaikovsky, Schubert, Schumann, Beethoven, Mahler… They look at and inspire one another. No need to turn this article into a never-ending enumeration of ballet, opera and symphonic adaptations of the Bard. Our topic of interest is A Midsummer Night’s Dream, an incidental piece of music composed by Felix Mendelssohn in 1842. The composition was at the centre of performances that took place between 23 and 25 October, at the Cairo Opera House’s Main Hall. 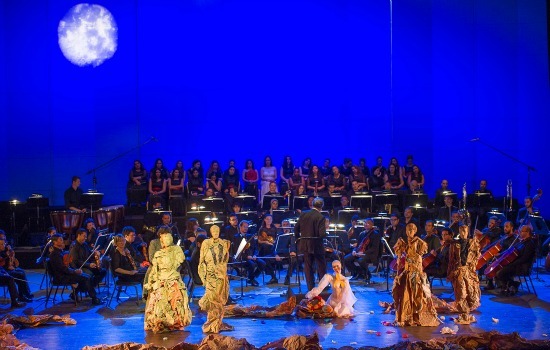 For four times (during three matinee and one soiree events) the Cairo Symphony Chamber Orchestra conducted by Ahmed Hamdy joined the Bard’s Midsummer Night’s Athenian lovers and fairies with a German early-Romantic composer, adding yet another creative layer: the Per Poc Puppet Theatre from Spain. Thus the performances fused Mendelssohn’s composition with a theatrical performance presented by the puppeteer Daniela Wick, who brilliantly animated the human-scale puppets made of paper. All the performers, the orchestra, the A Cappella Choir (under choir master Maya Gvineria), soprano Dalia Farouk, mezzo soprano Amina Khairat and the puppets, were placed on stage together, creating an impressive visual treat. Though Mendelssohn’s composition is not new to Cairo’s classical music regulars – and of course the Wedding March is one of the most famous pieces of music of all times – this was one of those rare occasions on which Cairo saw a performance that combined classical music with puppets. This approach to the Shakespeare-Mendelssohn duo was the initiative of the Per Poc Pupet Theare. “We contacted Maestro Ahmed El Saedi [the Cairo Symphony Orchestra’s principal conductor and music director] by email and he replied immediately expressing interest in our work. One thing led to another and here we are, joining the Cairo’s symphonic season,” Anna Fernandez, Per Poc Puppet Theatre production manager explains. The performances were first in the series of Family Concerts and School Concerts, and the latter drew a large number of young viewers to the concert hall. Per Poc was established in 1989 in Barcelona with the aim of creating a vibrant link between symphonic music and puppet theatre. “The nucleus of the company is its director and the puppets creator Santi Arnal who began the company working mainly with string puppets. In 1990, the first bigger project emerged, which was Sergei Prokofiev’s Peter and the Wolf. As the troupe grew Per Poc began working with different kind of puppets, integrating shadow theatre and other artistic elements,” Fernandez continues, pointing to the many collaborations with other companies and orchestras, and enumerating international appearances whether in individual concerts or music and theatre festivals. Today, Per Poc’s repertoire includes Stravinsky’s The Soldier’s Tale, Prokofiev’s Peter and the Wolf, Romeo and Juliet, Britten’s The Little Sweep and Tchaikovsky’s Nutcracker among many other works in which, apart from the orchestra, Santi Arnal reaches out to opera singers and dancers. A Midsummer Night’s Dream has been in the troupe’s inventory for several years already. The dramatic adaptation of the Shakespeare’s text was created by Julia Bel and Albert Plans, with puppet designs and vision by Anna Fernandez, Martina Tosticarelli and Santi Arnal, the latter being also the performance’s director. A Midsummer Night Dream’s adaptation sheds light on a multitude of the characters all represented by their respective puppets alternately operated by one actor. A Midsummer Night’s Dream can be a challenge to transpose onto the format chosen by the Per Poc theatre which opted for an abridged version of the text. The plot thickens as Shakespeare introduces several characters, and by the time of denouement, a number of interconnected storylines, each approached from a different angle through the consecutive acts until a resolution is reached. Mendelssohn did not disappoint the King, composing consecutive parts, including the 1826’s overture, Scherzo and Nocturne that draw on themes from the overture, alongside the impassioned Intermezzo, Song with Chorus, dances, as well as the famed Wedding March. His final composition consists of 14 sections, transporting the listener through honeyed melodies, cheerful fanfare, poetic beauty and lightness, all set in a captivating orchestration. Mendelssohn follows the Shakespearean complex plot, adds dances and music to entr’actes, always responding with the highest musical sensitivity to the needs of events and characters. As such the musical material is well intertwined with drama, complementing and helping to push it forward. Many theatre companies nurtured their performances of A Midsummer Night’s Dream with Mendelssohn’s music and many new creative visions have emerged from this marriage. What Per Poc Theatre chose is to present an abridged take on the Shakespearean comedy where two components, theatre and music, will be present on the stage. The theatrical structure designed by Per Poc picked bits and pieces from Mendelssohn, shuffling the music segments to support the director’s vision. Probably to accentuate its grandiosity, the performance closes with the Wedding March. Yet, as we witnessed on the one hand the orchestra, the choir and the soloists and on the other hand the puppet theatre, a more palpable interlocking between the two artistic powers would have been beneficial and would have given better justification to the choice of this specific format on the stage. Here it is important to stress the big role of the Cairo Symphony Chamber Orchestra which under Ahmed Hamdy’s baton rendered many sections of Mendelssohn’s work memorable, time and again, each within its own musical segment. Yet, speaking from the theatrical perspective, A Midsummer Night Dream’s complexity can be tricky and opting for a severely abridged adaptation needs a lot of thought on how to uphold the clarity of the intersecting plots. Per Poc’s format insisted on a large number of characters carrying with them their thematic baggage. Daniela Wick had to juggle the puppets changing her voice to impersonate Egeus, Theseus, Hermia, Lysander, Demetrius, Oberon, among others. Wick’s ability to fill the wide stage with creative movement and interaction was truly remarkable. However, in a one-hour show, where music segments already take their own time and space, a bolder dramaturgical simplification – maybe the removal of a few characters – might have helped the performance to deliver the plot in a more lucid manner. Adding to this the performance’s English language, the final result could only cater to a specific viewer. “It was definitely a very new, experimental and courageous endeavour,” Nagi Shaker, who attended the first performance, applauded the Spanish troupe. Shaker, who is considered to be the godfather of Egyptian puppet theatre and the chief designer of the iconic Al-Leila Al-Kebira, was primarily impressed with the format that joins the orchestra with the puppets. “Though it is not the first time that classical music partners with puppets or animation, the Spanish troupe is distinctive in creating a praiseworthy and unique atmosphere. The puppets themselves are very creative, light and easy to use. Large sheets of paper as material add a lot to the visual imagination,” he elaborated. Shaker however also pointed to the sense of an over-condensed plot within the time-frame presented and an accumulation of characters where the puppets strongly resemble one another. “The format probably reaches the experienced audience better; it definitely speaks well to the viewers who are well acquainted with the text. I am not sure it was easy for the young attendees to follow the performance through puppets which are not too distinct from one another, no matter how inventive they are. It might be difficult for the youngest viewers to differentiate between the play’s personalities and grasp the whole plot,” Shaker adds. However we decide to analyse the performance, one thing is for sure: it does provide a lot of food for thought. A Midsummer Night Dream plays on all the senses, enriches the viewers with great music, while presenting a fascinating dialogue between art forms. 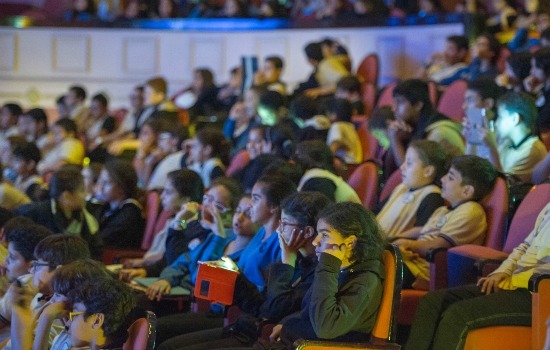 With simple tools – the chamber orchestra, choir and soloists joined by one puppeteer – the Cairo Opera House offered a stimulating performance. And regardless our judgment of details, this provides an interesting, and different, artistic experience. In a world where our lives are shortened by endless pursuits of everything but cultural stimuli, such testimony to the arts’ timelessness is what makes our days worthwhile. Indeed, Ars longa, vita brevis. 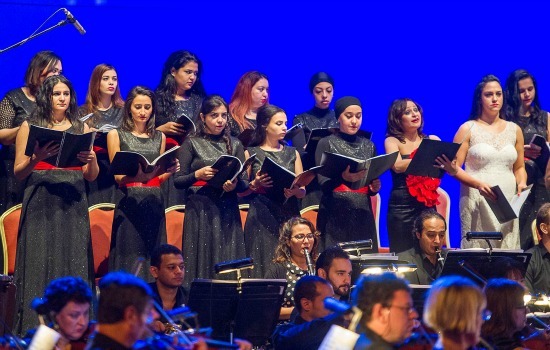 Initiatives such as cooperation between the Cairo Symphony Chamber Orchestra and a puppet theatre troupe give us a hope that humanity is still capable of embracing the many disciplines that it built through the centuries. Set within the Family Concert series, even if this time the performance targeted a niche audience, it still sends important messages to a growing generation of potential connoisseurs of fine art.